Bust of Janus, the Roman god of gates, doors, and beginnings. Vatican Museum, Rome. January is named for Janus, the Roman god with two faces, one peering back into the past and the other looking toward into the future. There’s sure a lot to look back on. Astrologers knew years before 2010 arrived that it would be an eventful year. Among other things, we predicted there would be earth events, environmental disasters, political upheaval, police crackdowns, and economic collapse. All of that happened and more. We also predicted personal challenges and sweeping changes, depending on where the year’s powerful planetary configurations fell in individual charts. Humans are wired to stay with familiar patterns, even when they don’t work – which is why the “shock and awe” of the cardinal T-square wasn’t necessarily a bad thing. Many of my clients have complained over the years that they were stuck, and more and more people have come to understand that it’s possible for circumstances to change in their lives, but the underlying patterns remain stubbornly ingrained. All of that has changed since the T-square. At the very least, the worn-out and decaying structures – in society, in our individual lives, in our thought patterns, perhaps within the planet itself – began falling apart so that something new could take their place. The process began slowing down after September, when the planets moved out of the tight cardinal T-square formation. Not coincidentally, we experienced flashbacks in December, after Mercury and Mars conjoined Pluto, and Mercury went retrograde. As 2011 begins, we’re still in a state of shock. Even those of us who experienced wonderful breakthroughs are reeling, mostly because circumstances changed so quickly. Everything is still in a state of flux and likely will remain that way this year. We’re riding a fast-moving current, and it’s all we can do just to hang on. The good news is that 2011 won’t be another 2010. Rather, it will bring an unfolding and ripening of whatever was initiated last year. Whatever was broken down entirely – including economies – will begin building up again, but in new and different ways. What still needs to break down further before it can be reassembled will continue to fall apart. And here is where we come in. We will indeed have choices, and our thoughts and actions will be critically important. Banish from your thoughts any notions of going back to how things used to be. Focus instead on how you as an individual and we as a collective can do things differently – radically differently – to achieve a different outcome. That is our mission in 2011. It will be accomplished through continuing spiritual awakening. In our personal lives, we can bring new worlds into being by giving less energy to the old way of doing things that doesn’t work and doesn’t allow us to live to our fullest potential. On a larger scale, corrupt and dysfunctional systems continue to exist as long as people feel powerless to do anything about them. As more and more people awaken, we’ll understand what our options are and work to bring them into reality. I am not naïve enough to think we’ll have a bloodless coup – indeed, violent public protest over the next several years is virtually guaranteed, with rebellious Uranus creeping toward an exact square to Pluto in authoritarian Capricorn. In addition to the general predictions I made in Part II of an article I wrote last year on the cardinal T-square, we may be headed for a class war, too. 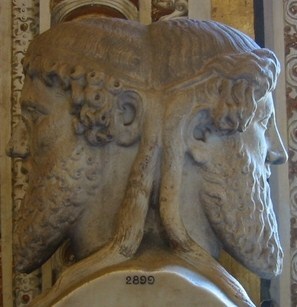 Janus was frequently used to symbolize change and transitions such as the progression of past to future, of one condition to another, of one vision to another, the growing up of young people, and of one universe to another. Hence, Janus was worshipped at the beginnings of the harvest and planting times, as well as marriages, births and other beginnings. He was representative of the middle ground between barbarity and civilization, rural country and urban cities, and youth and adulthood. Never was this symbolism more meaningful. We aren’t just standing on the threshold of a new year, but of a new universe. This entry was posted in Forecasts, Saturday Extra! and tagged cardinal T-square, Pluto in Capricorn on January 1, 2011 by Pat. I so appreciate the information you impart with your posts, Pat. The notion that “business as usual” is even remotely possible now seems laughable. It is, however, exciting to see the connection between the heavens and earth (as above, so below) and to realize that things are shifting in such huge ways. I suppose this might call up fear in some, but for me this feels so right that I cannot help but think my whole life’s been leading up to this point. (True for everyone, not just me!) In any case, thanks for being a voice in the darkness for anyone who is feeling lost in these energies. It is appreciated. Thanks, Shavawn! And thanks to everyone who has left comments or written to me personally with kind words. Although I’ve been swamped with work and slow to respond, I want you all to know that I appreciate your feedback and good thoughts. We’re all in this together!